When New York Magazine published a story about eight adults and three kids sharing one big house as a modern-day family of choice, it was shared more than 4,000 times in just the first few days. In the research I did for my latest book, How We Live Now: Redefining Home and Family in the 21st Century, I interviewed people across the nation who were creating their own intentional families or designing other innovative ways of living. In this two-part series, I am sharing excerpts from the book. Part 1 was “The Way We Live Now: Intentionally with Others, and Joyously Alone.” Here is Part 2, from pages 1-4 of How We Live Now. “In a slowly gentrifying section of Bushwick, Brooklyn, where gunshots are no longer heard and the local brothel has been turned into a family home, five friends made a 10-year commitment. In just a few understated sentences, the Times captured a way of living that would have been nearly unthinkable not so very long ago. A confluence of cultural, demographic, and economic factors have turned the opening decades of the 21st century into a time of unprecedented innovation and experimentation as Americans search for their place, their space, and their people. Demographics and Relationships: The five men and women in their twenties are making a 10-year commitment, and it is not to a spouse, nor even to the goal of finding a spouse, though that is not out of the question. It is a commitment to one another, a set of friends. In 1956, the median age at which Americans first married was as young as it has ever been—22.5 for men and 20.1 for women. By 2013, though, the respective ages had jumped to 29.0 and 26.6—and that’s just for those who do marry. Today, the twenties can be devoted to all manner of pursuits; marriage and children, while still an aspiration for many, no longer dominate. Geography: They are staying in the city, and not looking toward the distant suburbs. That’s new, too. For the first time in at least two decades, cities and surrounding suburbs are growing faster than exurbs. Architecture and Design: A century ago, many Americans were selecting houses from a Sears catalog. Now, adults can step into a big hunk of raw space and envision a place they will call home that stretches beyond a space fit for a couple or a traditional nuclear family. The friends have separate bedrooms. They share showers, a bathroom, and space for entertaining. They are also sharing their lives. They consider themselves family. These five people could have followed a more familiar script. Instead, they dreamed. They designed their own lives, with their own place, their own space, and their own people. Another group of young New Yorkers, all heterosexual single men, began living together just after they graduated from New York University. That was 18 years before they were interviewed about their experiences by the New York Times. When the rent for their loft in Chelsea doubled after fourteen years, they could have gone their separate ways. But they are close friends, and they instead chose to look for another place they could share. The four men, all approaching 40, found two stories of a concrete building in Queens which they affectionately call Fortress Astoria. The men have their own rooms (more like tiny apartments) and share a kitchen, living room, and garden. None of the bedrooms are adjoining, so the men have privacy when they want to bring dates home. Not one of the men is a parent. That doesn’t make them all that unusual. In 2012, the birthrate in the United States fell to the lowest level since 1920, when reliable records first became available. The ease and comfort they feel with one another is clearly one of the main attractions of the way the men live, but so is the money they save by splitting the rent and utilities four ways. Without the pressure of a pricier housing tab, the men can pursue circuitous, risky, and exhilarating career paths that the company men of eras past could not imagine. One of the men tried an office job for a while. The health insurance was nice, but the work wasn’t. He is now a personal trainer. His roommates are in film-making, acting, and the design of role-playing fantasy games. In a vibrant Seattle neighborhood, complete with markets, cultural venues, and convenient public transportation, a group of artists longed to find affordable housing. There wasn’t any. There was, though, an old hotel that captured the fancy of their dreamy minds. With help from the city, they converted the hotel into a cooperative home with 21 living spaces, including doubles, triples, and solo “Zen” units. The housemates—who range in age from 19 to 50—share kitchens, bathrooms, lounges, laundry facilities, and a roof deck. It is their responsibility to keep the building in good shape, but they throw work parties to get that done so it doesn’t feel like a chore. They have potlucks at home and organize outings to local stomping grounds. The Brooklyn, Queens, and Seattle stories are all examples of one of the newly fashionable ways of living in twenty-first century America: under the same roof with people who are not your spouse or family. The bond that unites the housemates is not blood or marriage, but friendship. The trend, however, is not confined to urban areas, to young adults, or even to artistic types. All across the nation, unrelated people who once went their separate ways (often with a spouse and kids in tow) are now living together. Bella DePaulo (PhD. 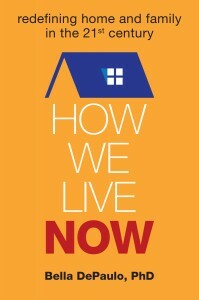 Harvard) studies single life and contemporary versions of home and family. She is the author of books such as How We Live Now: Redefining Home and Family in the 21st Century and Singled Out: How Singles Are Stereotyped, Stigmatized, and Ignored, and Still Live Happily Ever After. She writes the “Living Single” blog for Psychology Today and the “Single at Heart” blog for Psych Central. Visit her website at BellaDePaulo.com.